The McBride Viaduct, pictured here, was constructed in 1938 partially in response to a child being killed crossing the railroad tracks. When demolished, child safety will again come into question, as students will either have to cross the tracks or walk alongside the busy Bayfront Connector. Oliver Brown was a reluctant participant when he was named the lead plaintiff in a group of thirteen families that filed a lawsuit against the Topeka, Kansas Board of Education in 1951. The NAACP had recruited parents in a number of cities across the South and in border states who would attempt to enroll their children in white schools in segregated districts. In Topeka, the elementary schools were segregated but the junior and senior high schools were integrated. Elementary students were distributed across the city to 18 elementary schools – 13 white schools and five black schools. Unlike the four other cases that would be combined at the Supreme Court in 1953, the Topeka schools were generally considered equal, having qualified teachers, the same textbooks, and up-to-date school facilities. What remained in question, however, was equal access to the black schools. The Topeka schools were considered neighborhood schools and all of the white children in Topeka walked no more than a few blocks to attend school each day. Black children, on the other hand, had to travel great distances, by comparison, and were often required to cross railroad tracks and major roadways in order to reach their destination. We often think about the variables inherent in the school segregation cases as being directly tied to issues of quality in the schools. But the Brown case, in particular, reminds us that before anyone can address the quality of education, children need to be placed safely in their schools. Oliver Brown's seven-year-old daughter, Linda, walked six blocks to a bus stop, where she boarded a bus that took her to a school located more than a mile away. Meanwhile, there was a white elementary school just seven blocks from her home. Oliver and Linda Brown have come to mind several times during the past few years as the debate surrounding the McBride Viaduct has ebbed and flowed. This is, in part, because Erie's Public Schools still operate under an unmonitored desegregation order that was part of the Brown legacy. And while district administrators have done a remarkable job ensuring that city kids get the best education possible given the myriad social, cultural, and economic challenges these students bring with them, the job of keeping the thousands of students who walk to school each day safe falls into the hands of bureaucrats and interest groups whose concerns do not start and end with the safety of poor kids – mostly African-American and immigrant – whose families routinely don't vote. Without the viaduct, the kids who live south of the railroad tracks will have to make a choice that may literally be life or death: they will choose to take the PennDOT constructed path that will lead them to the walkway that runs concurrent with the Bayfront Connector, a four lane expressway on which cars drive at high rates of speed separated by a few inches and a barrier that does little to protect pedestrians from the rain, slush, dust, stones, and other naturally occurring residue of the road; or they will choose to cross the tracks where the viaduct once stood, giving them a direct access point to East Avenue and shorter walk to school on cold winter days. Lest we forget the easy choice most of us would have made at their age or the legacy of a bridge that was constructed in 1938 after a child died crossing these very tracks. The next time there is a significant snowfall, walk the walk. Try navigating the narrow sidewalk along Bayfront Connector south of 12th Street. The children who walk this path will add one additional mile to their daily walk to school if they follow the prescribed path to safely access the sidewalk along the expressway. And during the long Erie winter, they'll make this trek on a path that is, for the most part, under-attended to. This scene is not unique to the upper east side. It is replicable throughout the city. For example, kids as young as 5 years old walk on East Lake Road absorbing the full brunt of sitting water and melting snow thrown by passing vehicles as the kids make their way to the Robert Benjamin Wiley Community Charter School and East Middle School because the footpath under the railroad trestle located just blocks from the school are rarely clear in winter. 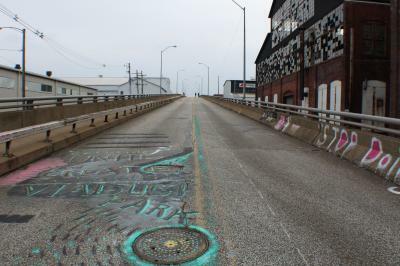 While advocates of saving the viaduct concede that the City of Erie, which is charged with maintaining the sidewalk on the Bayfront Connector, is "doing better," the path is often snow-covered and impassible because even if City crews diligently attend to it as the snow falls, they remain uncoordinated with the PennDOT crews that maintain the roadway and often force snow and muck from the road to the sidewalk. On a good day, people can comfortably walk two-by-two in one direction. If there is a bicyclist riding or a baby carriage being pushed in the opposite direction, it becomes an exercise in single-file civility. For years, members of Civitas and Erie CPR have tried to engage me in their defense of the McBride Viaduct and, for years, I have publicly remained viaduct agnostic. I didn't care whether or not the bridge at 12th and East Avenue would become Erie's highline, I didn't care if the viaduct was repaired to the extent that it could carry pedestrians or cars, and for a moment I didn't care if the various efforts to save the bridge were remembered as a failure or success. But respect for city residents who are forced to use the path prescribed for them by people who will never have to walk in their shoes is in short supply and that is the greatest disservice being carried out by the destruction of the viaduct. Mayor Schember paid lip service to the viaduct debate during last year's election cycle, but watching his dissociative recitation of prepared remarks after idling through more than 90 minutes of public comment at a recent City Council meeting embeds him squarely in the camp of co-conspirators who have made the destruction of Erie's symbolic past an ill-fated representation of future progress. During his campaign, Mr. Schember promised neighborhoods like those up and down Erie's east side that their voices would be heard, that their issues would be attended to, and that their children would be safe. But child safety is not an issue that requires public hearings, it is not an issue that should require years of debate, and it is not an issue that can be measured in dollars and cents. It is, quite simply, a basic civil right.